The Internal Revenue Service individual income tax filing season began Tuesday, with more than 150 million tax returns expected to be filed this year. This year filing parties will have several extra days to file their tax returns this year, as taxpayers have until Monday, April 18, to file their 2015 tax returns and pay any tax due because of the Emancipation Day holiday in Washington, D.C., falling on Friday, April 15. In addition the date change, there are a few new tax laws that are going into effect this year. First is the Affordable Care Act penalties will be in effect for the second year now and will rise slightly for those who have not signed up for health insurance. The minimum is $325 per adult and $162.50 per child under 18 years old or 2.5 percent of your household income whichever is higher, according to healthcare.gov. The maximum penalty a non-insurance carrier can expect to pay is $2,085 for the Bronze Plan as shown on the federal health exchange. Those who don’t have health insurance yet still have time, as those who sign up in the first two months of 2016 will not be penalized. Andrea Little, owner of Liberty Tax Service said that Pahrump is pretty split as far as insured and non-insured parties go. “I would say more than half of the people around town don’t have the penalty either for the reason that they have health insurance, or perhaps they’re under the filing threshold for owing a penalty,” she said. Health Savings Account holders who have a family can add an additional $100 to their HSA for a max of $6,750. Individuals’ cap does not change this year, as their cap held steady at $3,350. The personal exemption will rise slightly this year, as the total will jump to $4,050, or $50 higher than in 2015. For higher income earners the deduction no longer applies to them as it has that category of tax filers. Another credit that will rise slightly this tax season is the Earned Income Credit. That credit will rise $27 bringing the total to $6,229 if you have three children, $24 to $6,226 for those with two children, and single-child families can get up to $3,373, which is $14 higher than last year. Lastly, a few tax breaks that were intended to expire this year will hang around and become permanent ones. The IRA charitable transfer clause enables people 70-and-a-half years old or older to transfer $100,000 from their IRA to a charity of their choice tax free. Another big one is the Educator Expense Deduction for educators, which allows them to deduct $250 for classroom supplies that they weren’t reimbursed for before. Locals usually aren’t too aware of the tax laws, especially new ones taking effect, so Little expects to do her fair share of teaching locals as they file their taxes. “We do educate them in certain aspects because a lot of them are not familiar with the lingo as far as what they’re entitled to as far as what’s a refundable credit and non-refundable credits and stuff like that,” Little said. Little said that there are usually two waves of people who come in to file their taxes, the ones who get an early start and those who push it off until the deadline. “It’s kind of split. You get the early people who are getting a refund that come in right away because they want to get their money as quickly as possible and later on we’re more likely to get those who have more complex tax returns or those that owe money and they wait until the last minute,” she said. 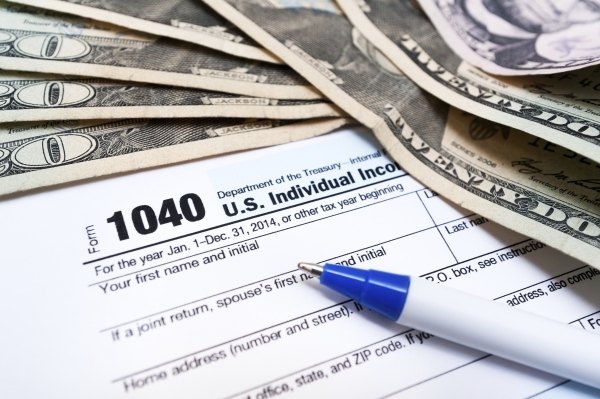 The IRS expects more than 70 percent of taxpayers to receive tax refunds this year. Last year, the IRS issued 109 million refunds, with an average refund of $2,797. The IRS encourages taxpayers to plan ahead and take advantage of the online resources available on IRS.gov. Just over four out of five returns are expected to be filed electronically this year, with a similar proportion of refunds issued through direct deposit. The IRS Free File program opened Friday, Jan. 15, and the IRS will begin accepting and processing all tax returns on Tuesday, Jan. 19. Commercial partners of the IRS offer free brand-name software to about 100 million individuals and families with incomes of $62,000 or less. Seventy percent of the nation’s taxpayers are eligible for IRS Free File. All taxpayers have access to free online forms, which provide electronic versions of IRS paper forms to complete and file. The option, available through IRS.gov is free. The IRS also reminds people to plan ahead, especially students and home buyers who request a copy of a tax transcript or tax return information for a specific year using the online ‘get transcript’ tool. They should allow five to 10 days from the time they make the request to receive it by mail.